“ছি ছি ছি রানী রাঁধতে শেখেনি… শুক্তনিতে ঝাল দিয়েছে অম্বলেতে ঘি!” the famous Bengali Song depicting how to cook Shukto properly! What else can I have taken to start this post! This song goes like this if translated. Rani does not know how to cook; She has added chili to Shuktoni/ Shukto and Ghee to Ambal/ Chutney! It seems obvious from the song that chili is considered as completely no-no to Shukto. By the way, I love to temper my Shukto with a piece of dried Red Chili. I do it every time I prepare Shukto or Shuktoni. Ummmm which means I can not cook Shukto! 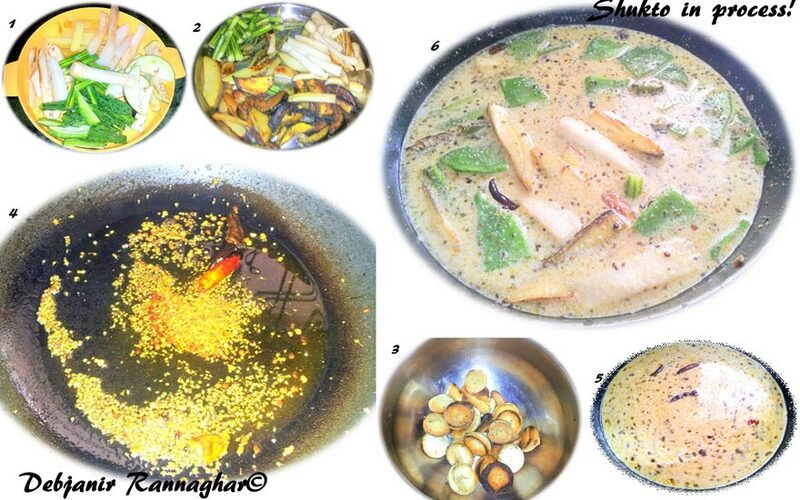 My father believes a Bengali cook must be judged by his/ her capacity to cook Shukto! I know this is lame on his part but at times we need to obey our parents; don’t we 🙂 . Believe me or not the cooking strength is judged by his/her skill to prepare Shukto properly at my parents! This is something that makes me worried each time I cook it at home. I have grown up seeing my mother and aunts cutting and chopping veggies with ease followed by cooking a big batch of Shukto. For me making Shukto is nothing but tedious. Almost every time, preparing Shukto for lunch is followed by no other dish on that day and something from outside in Dinner! I just fail to understand how Maa is able to prepare it so smoothly and without any mess in the kitchen! I mostly prepare Shukto a bit extra so that hubby can consume it for 2-3 days simultaneously. Husbandman is a fan of this dish and he can have his entire plate of rice only with it. Needless to say, whenever I cook Shukto, I cook it in bulk. I prefer to follow the recipe I learned from the Matriarch of my family. The process calls for Randhuni. I prefer to follow the detailed process where “Randhuni” plays a major role. In this post, I tried to detail the traditional process of making Shukto. Obviously while writing the recipe I have not mentioned about Dried Red Chili but it clearly showing its presence in each picture. So the choice is yours; whether to add or not! At Mehebub’s parents’; Shukto is not that popular. The Shukto I had there was a bit flat. 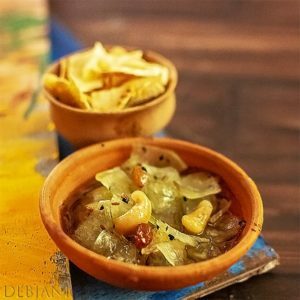 However, Mother in law is a great cook when it comes to other dishes that include Aande ka Halwa or Masoor Dal with Malabar Spinach etc. We Bongs; treat Shukto as a special dish and we have it on occasion like Marriage, Birthday etc. but as part of Lunch only. 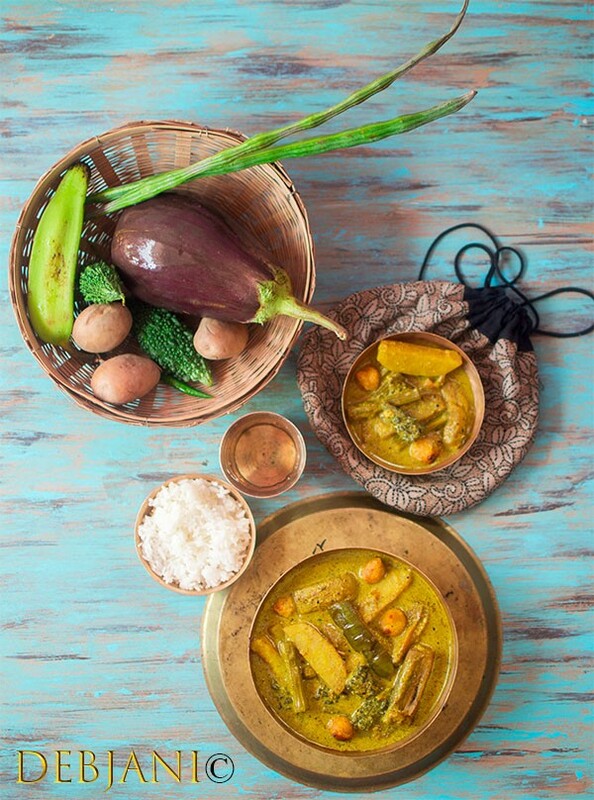 It’s a Bengali Mixed vegetarian dish comprising of several veggies inclusive of Bitter Guard, Eggplant, Green Banana, Potato, Sweet potato, Drumsticks, White radish and Hyacinth Beans. There is one exclusive spice that many Bongs prefer to use while preparing it which is known as “Randhuni” and I also love to use Randhuni while cooking it. I mostly purchase Randhuni from Kolkata and store for future use. 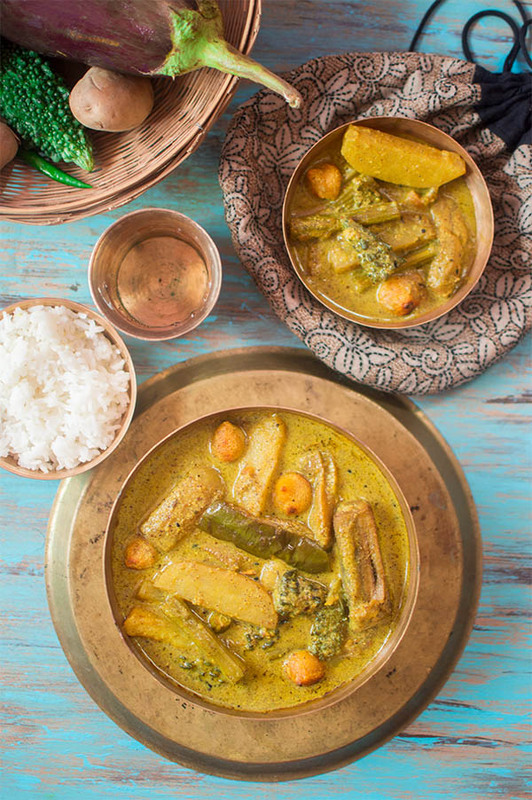 Shukto is a famous Bengali Mixed Vegetarian dish served with Rice. Poppy seeds/ Khuskhus/Posto: 2 Tbsp. Panchphoran/ Bengali Five Spices: 1 Tsp. Soak both Mustard Seed and Poppy seed in water for 10 minutes. Make a smooth paste of Poppy seed and Mustard Seed separately using a food processor or Shil Nora (Shil Batta). Strain the mixture to remove the husk. Cut Bitter Gourd, Eggplant, Green Banana, Potato, Sweet potato, White radish and Hyacinth Beans into rectangular strips ( ½") and Drumsticks into 2" long strpis after peeling the outer skin of each veggie except Eggplant. Heat Mustard Oil in a Wok and fry Bari in medium flame and strain from oil. Now sprinkle some salt and turmeric powder over the pieces of Eggplant and fry in the remaining oil. After that fry Bitter gourd. Now fry Green Banana, Potato, and Sweet potato, Drumsticks, White radish and Hyacinth Beans one by one. Temper remaining oil with Panchphoron and Randhuni. Add Ginger paste and cook for 1-2 minutes and add Poppy seed paste and Mustard paste and again cook for around 2 minutes. Add Turmeric Powder, Salt and Sugar again cook for 1-2 minutes. Now add milk and water to the Spice mix and bring it to boil. Add all the fried veggies along with raw Drumstick and cover the wok with a lid. Cook for around 8-10 minutes in low flame or till the veggies cooked properly. Check the water level and if required add some more water since Shukto should have sufficient gravy. Add Ghee to the Curry and boil for around 2 minutes and switch the flame off. Shukto is ready to serve. Serve it hot with steamed rice to initiate the meal. Cut all the veggies except drumsticks in equal size. Panchphoron is a mixture of Nigella, Cumin Seed, Fenugreek, Fennel, and mustard seeds in equal proportion. You may use only Mustard seed instead of Panch Phoron. Randhuni is a close relative of Celery Seed. In Bengali cuisine, Randhuni is used for tempering the oil. Let me end with the Bengali Song that I mentioned earlier which is telling me I am nothing but a proper cook who knows Bengali cuisine:). 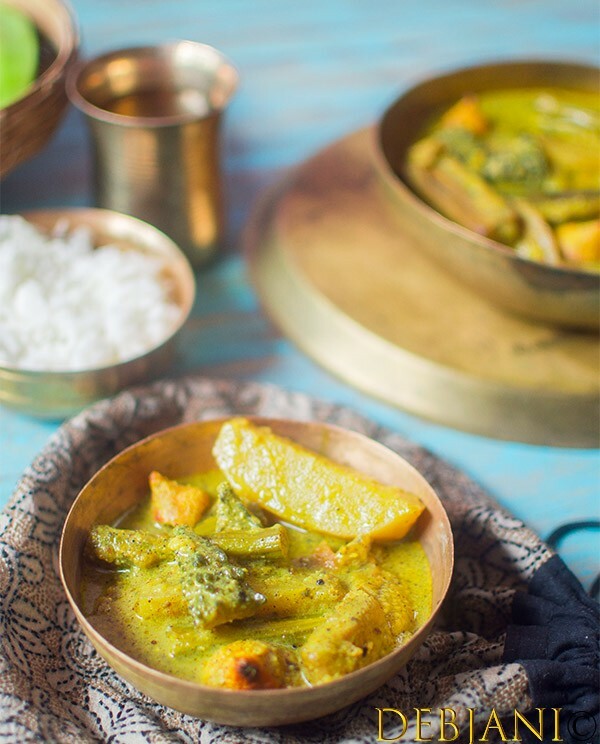 Do try the Narkel diye Niramish Ghugni or Katoya Data Chorchori or Papor er Dalna or Kochu Saag er Ghonto for the Bengali vegetarian experience. 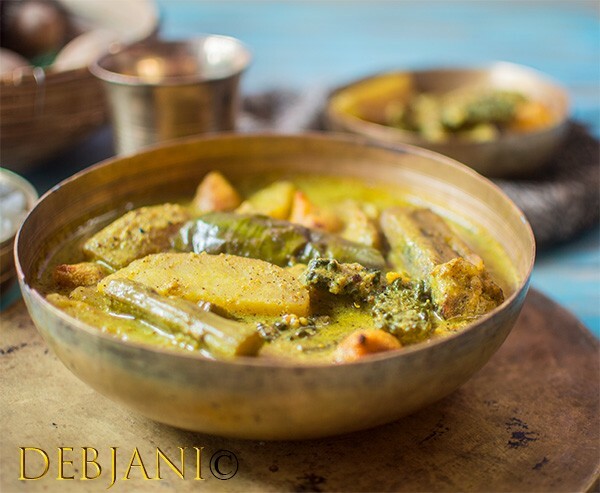 Have you tried the Shukto Recipe from Debjanir Rannaghar!